The lid on my 19 guage steel wire tin failed. 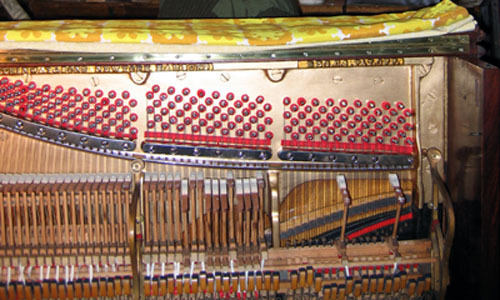 As I was drawing out a length for this model L Bechstein, the lid suddenly jumped off – and I got THE WHOLE LENGTH…in one big tangled mess! That’s 500g of diamond-drawn piano wire wasted. But as you can see in the second photo, it all worked out well in the end – especially with these beautiful looking and sounding EKA bass strings.